Two authors step up for generous PLP donations! We just wanted to thank two very generous authors for their donations to the Prisoners Literature Project – both of which have significantly helped the organization. 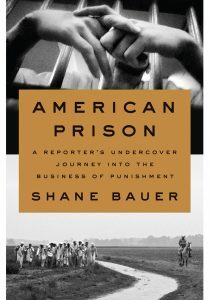 “In 2014, Shane Bauer was hired for $9 an hour to work as an entry-level prison guard at a private prison in Winnfield, Louisiana. An award-winning investigative journalist, he used his real name; there was no meaningful background check. In addition, we also wanted very much to thank Kelly Notaras, who made a notable donation to PLP in association with the imminent publication of her ‘how-to’ book ‘The Book You Were Born To Write‘. This title includes a simple, step-by-step path that takes authors from concept to finished book! Thanks so much to both authors.